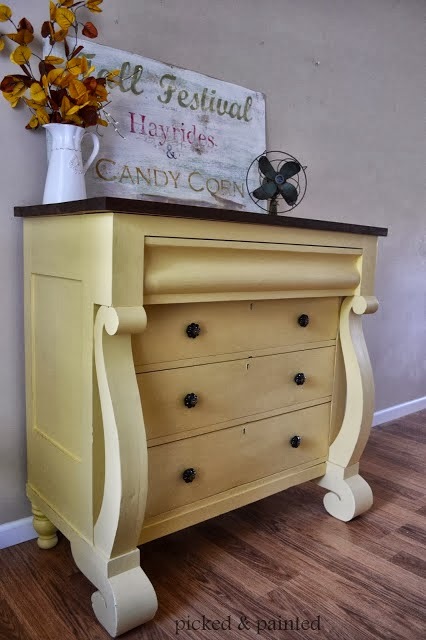 This mellow yellow dresser from Helen at Picked & Painted is just beautiful! And it's even more amazing when you take a look at the before! Now that is a great save! And what would you imagine if you saw this in your neighbor's trash? Well Kathleen from Between Blue and Yellow had the vision to create this amazing padded storage bench! What a wonderful cozy spot she created! Angela from Number Fifty-Three added a little drama to her entry with a beautiful wall stencil! Korrie from Red Hen Home is a just wiz at furniture building. 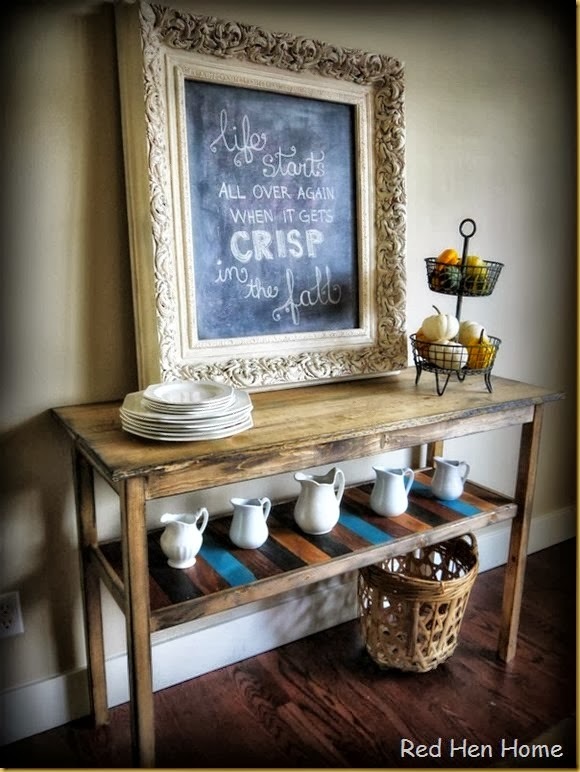 Don't you just love this rustic console table with a very cool multi-colored shelf! Amy from Home Sweet Thrifty Home used stripes to gives this little end table a fresh new look! 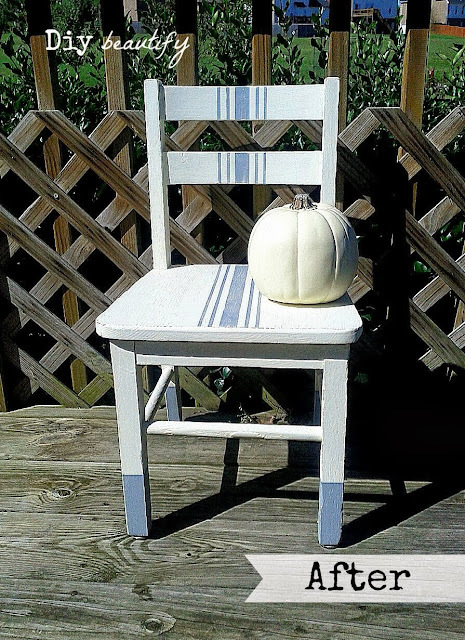 More stripes and little dipped feet make for really sweet pint size chairs from Cindy at DIY Beautify! Barbara from Food from the Heart whipped up a yummy batch pumpkin pancakes with ginger spiced syrup. Not only would they make for a hearty breakfast, but I'm thinking breakfast for dinner! 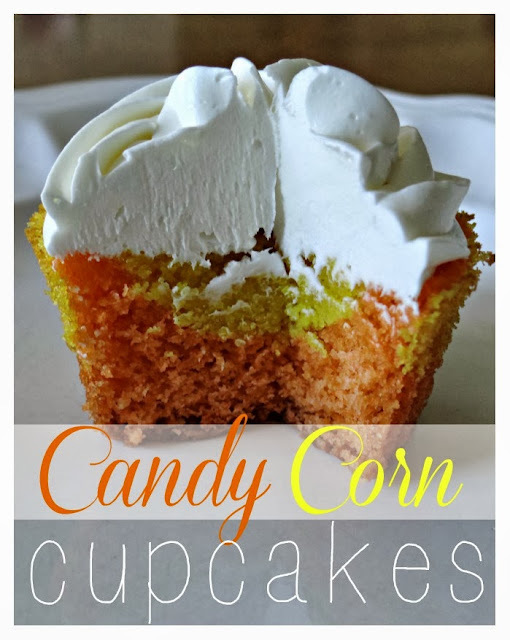 And how cute are these candy corn cupcakes from Emily at My Love for Words! They make me want to throw a Halloween party! Awesome features! Thanks so much for hosting! The furniture transformations shared here each week never cease to amaze me! That yellow dresser - swoon! The next one - the bench - so creative! I have two dressers in the garage - I'm inspired to get out the paint! Thanks for hosting, Sharon! All the features are lovely; that bench makeover is so pretty in its final place of display and use! Lovely! Thanks for hosting every week...now I need to go check out some of the links. These transformations in the features are amazing. Thanks for hosting. Hi Sharon! 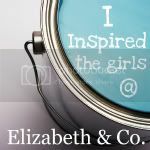 Love your new blog look and your name tag! Thank you so much for hosting and for featuring my entry! :) Have a great week! Helen's dresser really is amazing, Sharon! Wow! And your dresser came out beautifully too! I do like the stained tops...glad yours ended up being easy to do. The features are amazing. LOVED them all. Thanks for featuring my console table, Sharon! What a great round up! 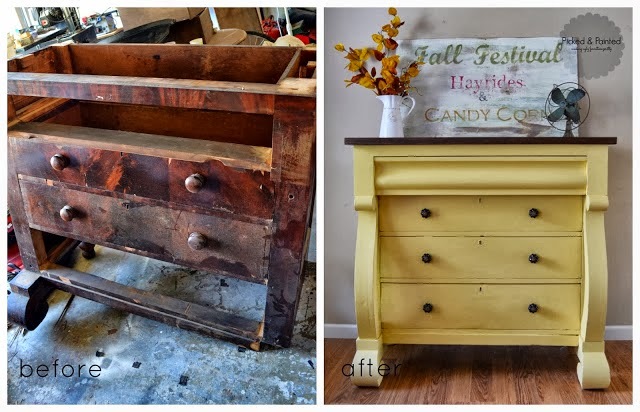 I can't believe the before on the yellow dresser! My favorite is that found bench. I was thinking I would do the same thing with it. 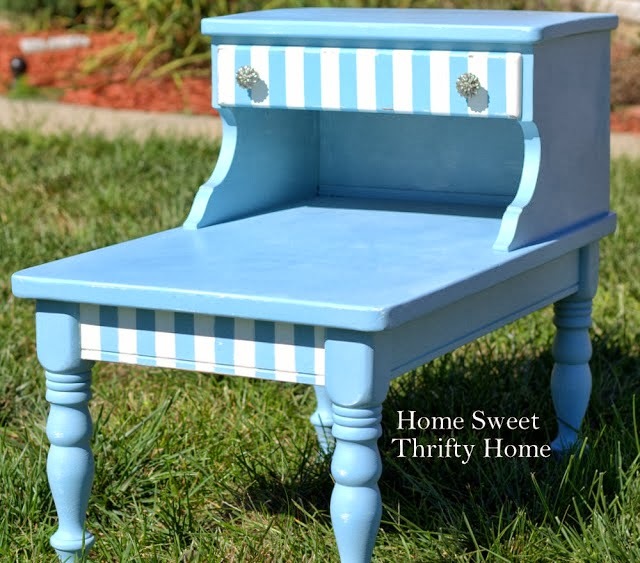 So cute, my kind of furniture! Sharon, thank you for featuring my yellow empire! You picked some amazing features. They were all so good....and those pancakes are making me hungry! amazing features!!! and i need those pancakes in my life now. 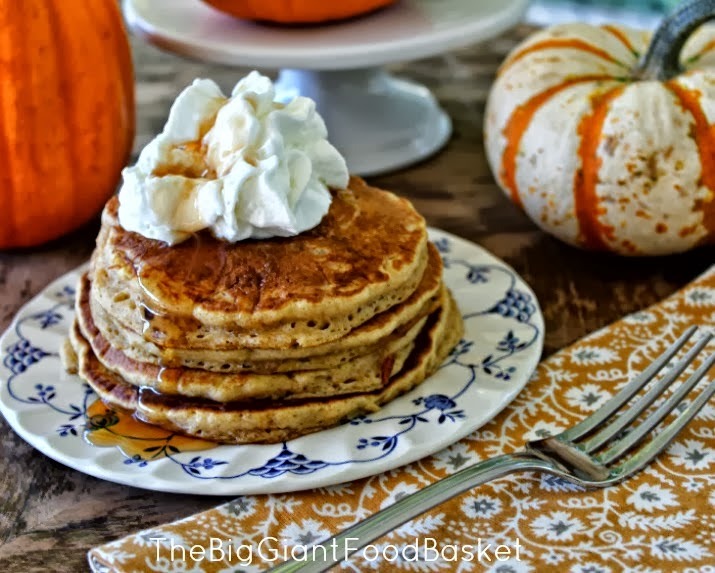 Sharon thank you so much for hosting and especially for featuring my pumpkin pancakes! Super furniture ideas...loved them all!! Have a great week! Hi! I found you through Cornerstone Confessions Blog Party Directory. I would love to see your home decor' ideas! WOW those features are amazing!! I am in love with the storage bench and that mellow yellow save! Thanks for hosting a great party!! Really wonderful features, Sharon. Thanks so much for hosting. Hi there Sharon Fabulous features! Thanks so much for hosting this party. Hi Sharon, Thank you for hosting and also for featuring my table! Have a great day!